Looking forwards and backwards to prepare for the future through a dynamic sampling and remixing of history. 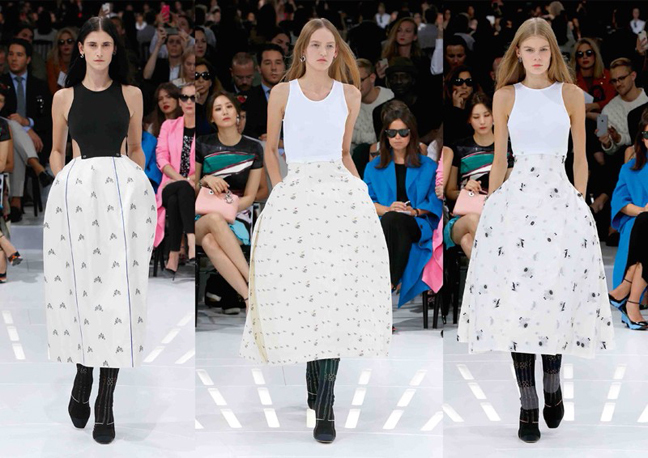 In the Spring-Summer collection Raf Simons, Artistic Director of Christian Dior, instigates an exploration of the past combined with ideas of a near future, democratising the traditions of haute couture by taking them into the realm of the pret-a-porter. Eschewing strict historical accuracy and embracing an amalgamation in the imagination, the historical sprawl of the collection spans influences from the 18th Century onwards; it takes in 18th Century French royal court attire of both sexes and similarly synthesises and mixes ideas from the uniforms of pilots and astronauts, even school girls and skaters. As the Robe a la Française – a variation on traditional dresses of the 18th Century and an amalgam of styles mostly worn with a new form of panniers and t-shirt bodices – becomes the Flight Suit a la Française, so too the Justacorps and Gilets – the masculine “court coats” of the 18th Century – segue into the street aesthetic of skater’s shorts and the fluid form of godet dresses. Sinuous, long line coats with an Edwardian origin travel through time and history in heavy washed silk satins and thick calf leather. The transposing of traditional technical details is employed at the service of structural form; bodices become skirts, jackets become blouses, smocking and openwork structures, while the construction of footwear is hand knitted. A repeated layering of traditional silk jacquards appears as a purposeful stratification of history, while new “micro jacquards” take the form of a digital grid, resonating with the traditional Dior Canage quilting, itself elaborated on and transformed in the leather goods.